The EU and Japan are both major international trading powers, and our trading relationship matters to both of us. Japan is the EU’s 6th largest overall trading partner whilst the EU is Japan's 3rd largest overall trading partner (after China and the US). We are currently negotiating a Free Trade Agreement (FTA, also known as the Economic Partnership Agreement, or EPA) which could bring significant benefits to both parties. Machinery and transport equipment represented 37% of the total EU exports to Japan in 2016, chemicals 25% and all other manufactured products 22%, while primary products (such as agriculture, raw materials and energy) represented 14%. Machinery and transport equipment alone accounted for 65% of the total EU imports from Japan in 2016, while chemicals accounted for 10% and primary products for 2%. As for services, exports to Japan grew from €26.1bn in 2014 to €28bn in 2015 whilst services imports to the EU from Japan increased from €15bn in 2014 to €15.9bn in 2015. The EU's surplus of €12.1bn in its service trade with Japan was mainly due to trade in financial services, computer/information services, travel, air transportation services and other business services. The EU and Japan are two economic giants, together accounting for a third of world GDP and more than a fifth of world trade. Studies show that the successful conclusion of an ambitious free trade agreement between EU and Japan could deliver a potential 32.7% increase in EU exports to Japan. Japanese exports to the EU could rise by as much as 23.5%. The FTA matters to both sides. The negotiations take place in Working Groups which cover the following areas: Trade in goods (including Market Access, General Rules, Trade Remedies, Industrial goods), Technical Barriers to Trade and Non-Tariff Measures, Rules of Origin, Customs and Trade Facilitation, Sanitary and Phytosanitary Measures, Trade in Services, Investment, Procurement, Intellectual Property, Competition Policy, Trade and Sustainable Development, Other issues (General and Regulatory Cooperation, Corporate Governance and Business Environment, Electronic Commerce, Animal Welfare) and Dispute Settlement. Negotiations were officially launched on 25 March 2013 by the then Commission President Jose Manuel Barroso, Council President Herman Van Rompuy and Japanese Prime Minister Shinzo Abe. In accordance with its negotiating mandate, the EU assessed the progress achieved during the first year of talks and whether Japan had implemented the commitments it made prior to the launch of the negotiations. 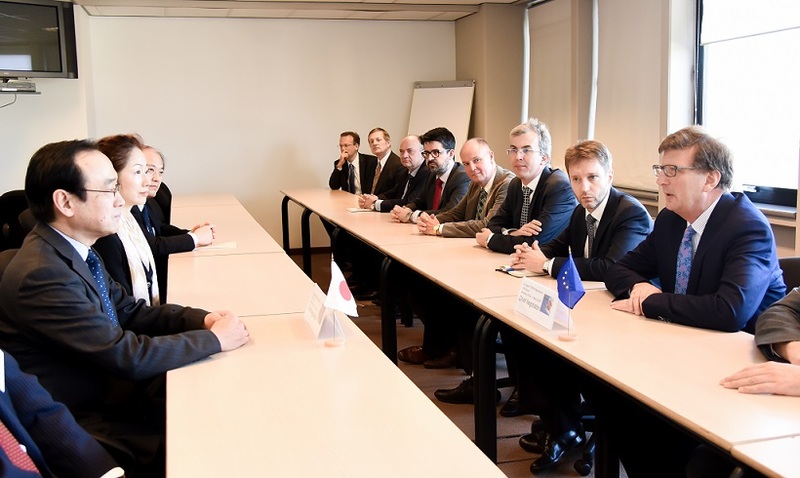 Despite some concerns, it was agreed in May 2014 that the negotiations should continue. Following that, in July 2014, the 6th round of negotiations in Tokyo marked the resumption, and a second stage in the negotiations. The 17th round of negotiations took place in Brussels in September 2016, and the 18th round took place in Tokyo in early April 2017.